You can find Ann here and here on Ravelry. Creativity is among the very most interesting things in life to me. I feel inspiration is pretty much everywhere, when we’re open to experiencing it. Consistent sources for me include, but are not limited to – yarn, color, texture or stitch patterns with their endless possibilities of combinations; line and shape; or becoming very quiet and still, going within – any of these elements can be the inspiration point. I believe the creative process can be highly variable. At times, I have had that flash when I may see every detail of a new design. And I’ve also experienced painstakingly swatching to the length of a scarf, but it’s a jumble of stitches without finished order that I have to see and allow to inform me. I greatly enjoy watching a design evolve. Often that initial inspiration or direction is followed by research or experimentation. It’s a very visual process that leads to the very technical process of writing and sizing the pattern. 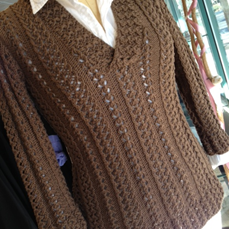 My niche as a knitter is primarily women’s sweaters worked in smooth yarn, solid color and texture with an occasional skirt, dress or tunic thrown in. I love the invisible seaming from the right side of a garment. Seams give definition, structural integrity, body and fit to a garment. I know of no reason to avoid them. Look at the fine dress makers. Look at couture clothing. Usually, it is 4 – 7 sizes, determined by where a design is published. I look at fashion magazines to be aware of trends. I look at designs online only as time permits. I think we’re in the information age. I think online publishing of patterns allows for more explanation than print does. If a pattern gives more information than a knitter needs, an experienced knitter will jump past information they already know. If a pattern gives information that a less experienced knitter needs, chances are they are going to learn something and have a better experience and result. Let’s face it, knitting patterns have been written in some cryptic or general styles in past eras. I have some knitting publications from each decade back to the 1900’s and it’s hard to believe how recently patterns were published without schematics. I like being able to include information in a pattern that helps to ensure a better result and if that means explaining a blocking detail that enhances the finished garment, for example, then that’s something I want those making it to know. I do it all myself. It’s one of my favorite parts and I love process. I feel I can make better decisions as a designer if I knit a piece myself. Possibilities occur that I may not have been able to see otherwise. Honestly, no. Although I do ask myself quite frequently, what’s next? 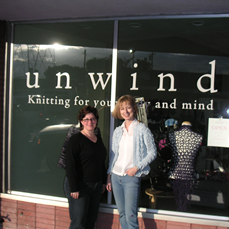 It was a surprise to me to become a knitting author. I had been designing the sweaters that I wanted to wear. I have no formal training in this field, I had never written a book, and I submitted to one publisher. I studied knitting books and magazines. I had an internal sense that I would write a book one day, but did not know what type of book. I feel that Barbara Walker is my mentor in the knitting world. 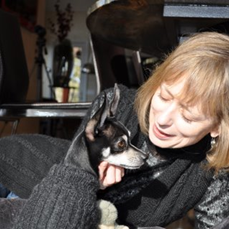 Without her stitch collections, I don’t know that I would have started to design sweaters. I love her respect of history and use of original names of stitch patterns. It is unusual for me to have a mentor I have never met, spent time with, studied with, etc. No again, one thing has led to another and I have followed what it’s led to. 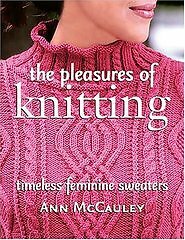 For example, Martingale & Company sent my first book, The Pleasures of Knitting: Timeless Feminine Sweaters, to Knitty Gritty and that led to me filming Delightful Details for them. 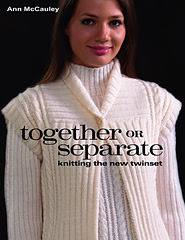 After doing a second book, Together or Separate: Knitting the New Twinset, with Martingale, I realized that I needed to focus on single designs for awhile. Two years ago, I met Jared Flood when we were both teaching at Yarnover in the Minneapolis/St. Paul area which led to having designs in his Wool People Collections. I think the Internet is changing the knitting world daily in ways we are still discovering. Look how quickly Craftsy has altered the accessibility of knitting classes. It’s been a huge door opener for independents in the field. Oh yes! There are a very few exceptions when something is of an extremely simple nature. Eat well, sleep well, listen to the body, exercise, remembering to live in the present. Listen, reflect, respond. Ask questions. I like variety in my work life so knitting is not my sole support. I enjoy a blend of working at home and away from home. It’s the same advice I would give to someone in any career – do what you love.